Plant: perennial herb; stems erect or ascending, typically unbranched, 10-50 cm tall; milky sap Leaves: opposite to irregularly alternate, the petioles 2-7 mm long, the blades narrowly lanceolate to linear, 5-14 cm long, 2-17 mm broad, attenuate to an acute apex, acute to obtuse at the base INFLORESCENCE: UMBELS lateral at 1 to few of the upper nodes, 3-4 cm broad, the peduncles 0.4-1.5 cm long Flowers: small; calyx lobes 3-4 mm long; corolla greenish, the lobes 5-7 mm long; hoods greenish yellow, erect and appressed to the anthers, ellipsoid-oblong, obtuse-rounded at the top, 2.8-3.8 mm long, 1-1.3 mm broad in the middle, ca. 1 mm shorter than the gynostegium, the horns absent; anther wings 2-2.6 mm along their entire length, the upper portion 1.4-1.7 mm long; corpusculum 0.3-0.4 mm long, the pollinia conspicuously long attenuate above, 1.6-2 mm long Fruit: FOLLICLES erect on deflexed pedicels, 7-15 cm long Misc: Open pine forests; apparently rare; 1600-2150 m (5300-7000 ft); May-Aug REFERENCES: Sundell, Eric. 1994. 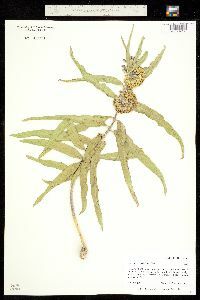 Asclepiadaceae. J. Ariz. - Nev. Acad. Sci. Volume 27, 169-187. In sandy soil along roadsides and railroads and in fallow fields. It prefers sandy soil and is apparently a prairie plant but it is sporadic in the southern part of the state. Acerates viridiflora var. lanceolata (Ives) Gray is a variety which has been reported from Indiana but which I am referring to the species, as some authors do, because I am not able to separate the two. 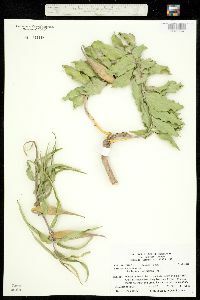 I have one specimen with some of the leaves 5 cm wide and one specimen with leaves 8 mm or less in width, and other specimens with leaves that connect these extremes. Since the width of the leaves is the only distinguishing character, it is best to consider the species as one with variable foliage. A very narrowleaf form occurs on the low dunes in west Gary, Lake County.